Green Toys is reinventing playtime. Their collection includes iconic playthings like tea sets and trucks and sand toys but they've added a new twist to the classic forms: all Green Toys are made from recycled plastic and other environmentally friendly materials and ship in recycled corrugated boxes with no plastics, cellophane or twist-ties, and are 100% recyclable once you've taken the toy out. 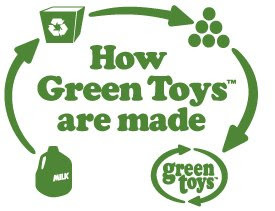 Green Toys are also manufactured in the US, unlike most of the inventory on toy store shelves these days. 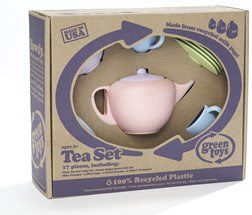 We received a couple of items from Green Toys to review, the Tea Set and the Dump Truck. The Tea Set is so lovely to look at and hold that I was inspired to make a sweep and rid Roo's toybox of all the chintzy plastic dishware we've accumulated in the past five years. These HDPE plastic pieces feel substantial to hold and I like the fact that they contain no traceable amounts of phthalates or BPA. They are also designed without any external coatings, eliminating the fear of lead paint. And nary a peeling-off Princess sticker in sight! We love the imminent playability (for both genders and most age groups!) that Green Toys offer. I look forward to seeing what they come up with next. I've seen the toys at Target (but for some reason, they've disappeared right when I was going to buy one) and they do seem sturdy. 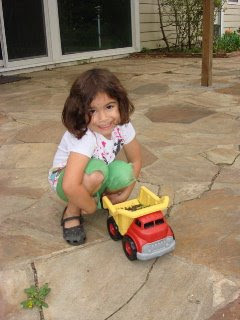 I love that you got a tea set and a dump truck...kind of an oxymoron or something. PS Roo's hair looks red in that last shot. They sound great, we'll have to check them out. 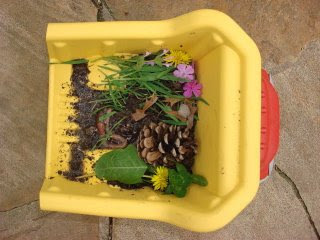 Love the spa treatment for worms! Kids are so creative!